Two small castles are located opposite each other and only water is around. You have no other way, you can only shoot at the enemy's castle and destroy it. The beauty of this map is a constant action and non stop shooting. No, throw out of your head the usual arrows, explosive shells will appear in their place, which means each shot creates a mini explosion and destroys part of the castle. The pre-assigned number of players is 2, since this is the optimal number of participants for a battle in a few minutes. Did you call a few friends? 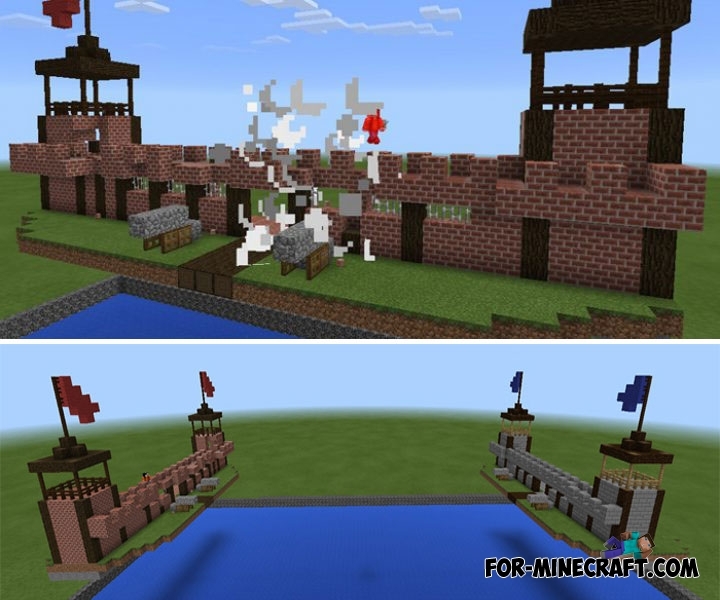 Then engage in construction during a firefight, otherwise both of the castle will be destroyed in the first minute. The map is really interesting for fun, do not think about logic, you do not need it, shoot the target and do not stand still. Explosive Arrows addon for Minecraft PE 1.XThis weapon is superior to all original types, including the best swords, fireballs and shells. The Explosive Arrows addon replaces standard little..